Exclusive Corps Store design t-shirt. 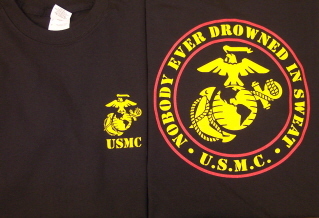 The front design has a gold Eagle, Globe and Anchor with USMC on the left chest . The back design is Nobody Ever Drowned in Sweat with an Eagle, Globe and Anchor in the center. Heavyweight 100% preshrunk cotton in sizes small - 4XL.